PING PONG RACKETS THAT ARE COMFORTABLE TO USE - Red side - When using this side of the paddle, players will have good control and will help develop their strokes. Black side - On this side, the pimpled rubber (pips) are facing out, the short pimples will help you return offensive shots with maximum spin. The weight of the paddle is optimal for play and the flared handle fits comfortably in your hand. 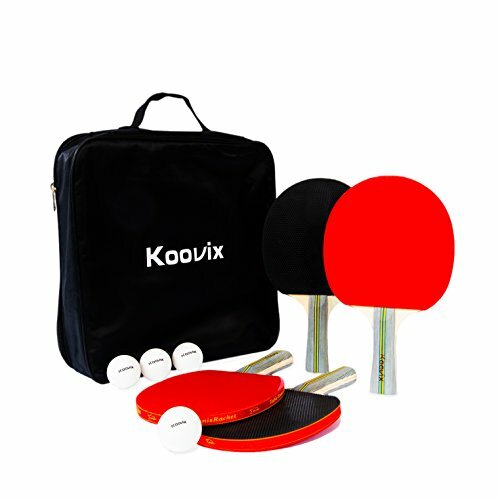 DURABLE TABLE TENNIS SET FROM KOOVIX - Well constructed set of 4 table tennis rackets and 8 quality table tennis balls. This set can be used for indoor and outdoor play. The blade is made of 5 layers of wood for superior strength. The convenient zippered storage and carry case keeps the rackets dirt and dust free. OUR POPULAR PING PONG PADDLE FLARED HANDLE IS COMFORTABLE TO USE - The flared handle is the most popular handle shape for top players, it is thinner at the top than the bottom for maximum control and comfort. This flared shape offers comfort and a superior grip on the paddle. Our handle shape is the most common among professional ping pong players due to the fact that they're so comfortable to hold. The flare makes these handles less prone to slippage and offers versatility. AT KOOVIX YOUR SATISFACTION IS OUR TOP PRIORITY - You can count on us to do everything in our power to give you an excellent customer experience. If you have any questions about this product by KOOVIX, contact us by completing and submitting the form below. If you are looking for a specif part number, please include it with your message.